Holy Cow! Sandy! You sure cowed this one. Another cowd that jumps over the moon. As always, I could watch your videos til the cows come home! Merry Cowmas!! Cow ya doin’? This is udderly the moooooost fun I’ve had in quite a while! I am so mooooved by all the cowments and more moooved by your mooooving cowd… it’s so darn cowed! I love all of the puns and am pretty sure they’ve all been cowvered. Just want to say your videos and blog are grade A prime. Thanks! Such a fun image and card! I like deja moo. I like big cows and iI cannot lie. The udder brothers can’t deny. I meant to write that your cards are udderly moo-ving, so it behooves me to cud-rrect the error! Oh, Sandy, just be-cud you can, doesn’t mean you should. That’s what I herd, anyway. I had to check my cowlendar to make sure the deadline hadn’t pastured already to enter! I’m going to be up cowlll night laughing about these puns. They’ll probably lock me up soon on 3 cownts of disturbing the peace! . Anyway, I’m over the moooo-n for all these silly puns! Happy MOO Year!!! Love your funny card!!! Totally a-MOO-sing. That card got me MOO-ving to a funky beat. Can I give you a cow joke instead? Why did the cow cross the road? To get to the Udder side! This is such a moooocho cute card!! I udderly can’t wait to add this to my stash! I love it! It really moo overs me! This thread mooooves me to tears! Your blog posts are never udder-whelming. They moo-tivate me to make my own cards using my Moo-pic markers. I never ‘stall’ out of ideas. You milk every coloring tool for all they are worth. Your coloring is the cream of the crop. After reading your posts, I always want to hoof it to the craft store! I’m sure if I was in a class with you, you’d whip me into shape udder your tutelage. Your prodding helps me be a better artist. I’m glad you recommended prismacolour pencils as they are so smooth and creamy. I was bullish about getting them for a while; I was on the fence but I took the bull by horns and I love them now. I keep them on my calf-desk. You always steer me the right way! This was fun! Ha ha! You are really “milking” the cow theme with this card! 😀 Thanks for a chance to win. you have and udderly great sense of humor! you have and udderly wonderful sense of humor! You’re entire blog moooov’d me and I just couldn’t stop thinking about cows. Take a straw vote and see if there are more puns out there that can be herd. Then sit back and be udderly exhausted thinking about ding dong dung bells for Christmas. Well, I can’t think of any moo-re!! I’m going to milk this for all it’s worth while enjoying utterly delicious cookies! Where’s the beef? Love the way they can shake their moo-ty! The cow jumped over the mooooon. 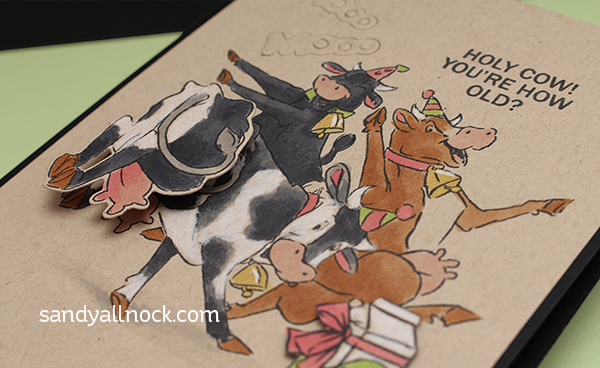 Love the wobbles… they make a very moo-ving card! Holy cow…those critters are so cute, your card almost moo-ved me to tears. Have a happpy moo years! I hate to horn in on these udderly fantastic comments, but I herd their was a prize involved. No bull; it was moo-sic to my ears. I rounded-up my cow-culator and did some cow-culus to see if it was worth my time to participate. I don’t want to be a laughing stock, but it’s pasture bed time, and you need to pick me. Don’t let this go in one ear and out the udder. You can run, but you can’t hide even in that cattleac I saw you driving. Really cute card! And……….Why aren’t cows good listeners? Because it goes in one ear and out the udder. What do you call a cow with one leg shorter than the other? Lean beef. Holy cow! I ox you not to brand me as a coward – I’m in! When I herd about this I just had drop my de-calf coffee to hoof it over here to take stock of your udderly amoosing card – a rare breed! I see the cows have bells… that’s because their horns don’t work, you know! Now you may have deja-moo… the feeling you’ve heard some of this bull before…. I cow-culate you’ll think I was milking it, but I couldn’t let this comment get pasturize without beefing it up to be the cream of the crop as the steaks are high!! I’ve not told you all the cow puns I cud – I’m just grazing the surface…. you need to steer me away becows I could go on for heifer and heifer! Pull my name and it would be moo-sic to my ears (LondonDAIRY aire… please don’t be mootivated to kick me in the derriere) !! Holy cow!! Such a cute cow card !! I am over here rolling on the floor laughing out loud at the FABULOUS comments. These comments totally ROCK!!!! I am commenting not to win, but just to say how awesome everyone did. I hope each of you (and Sandy) have a very joyful holiday and thank you for the smiles. The Secret Service surrounded the president with dozens of cows. They wanted to beef up security. Thanks for your cute cow card. Udderly moo-ving to think of a nice gift. Here’s a couple of cow puns…It’s udderly ridiculous!….and…..That’s just grazy talk! What’s a cow’s favorite subject in school? Second try. That card moo-ved me. I’m glad it wasn’t dairy free! Okay, that card moo-ved me. Glad it wasn’t dairy-free! The steaks have been grazed with this card. Fifty dollar gift certificate is an awesome prize, I’ll have to get out my cowculator to add up all my goodies. Now get some rest…it’s pasture bedtime. Love the meatiness on your card!! Your cards are always utterly amazing and totally fun!! Can’t believe she stole my comment. Utterly impossible to come up with a gluten free, grass fed idea, so moo me! I am so amoosed that so many people read the directions. I’ve been chewing my cud to think of something original. Your card and this contest are udderly fantastic! My cousin from Wisconsin always talked about her fords–since I’m a car nut, I was disappointed when I visited and found they were cows! Do I really have to come up with a cow pun to comment? Let me just say how udderly cute this card is. Your cards are utterly mooving!